Gout sufferers need to do all they can to treat their condition instead of letting it get worse over time. That only causes more problems in the long run. Our Bio Nutrition Gout Out review is going to take an honest look at whether or not this product is worth your hard earned dollars. We will explain to you what it does and if it is safe. 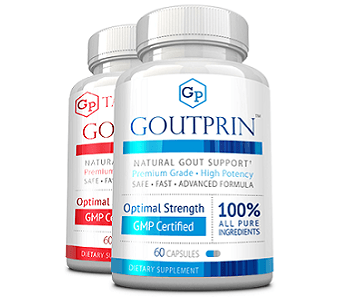 Gout Out claims to be a blend of ingredients that work in synergy; including fruit and herbal extracts, as well as vitamins to aid and support the management of healthy uric acid levels. B-Vitamins help shuttle nutrients around the body and play a vital role in energy maintenance. Vitamin C plays an essential role in the maintenance of the immune system. It also helps the body create collagen which is responsible for skin, joint, tendon and bone health. Black cherry extract is a popular natural supplement with many health benefits and it is found in many gout supplements for helping to regulate uric acid levels in the body. This is the same with celery seed extract. Turmeric is used for its anti-inflammatory properties. The manufacturer recommends taking 3 capsules per day with a glass of water. It is also stated that the dosage can be increased to 3 capsules 3 times per day if needed after speaking to a doctor. Nine capsules a day seems quite excessive. You should not witness any side effects with this product as it contains all natural ingredients. However, it is important to consult your doctor if you have any concerns. The recommended retail price for Gout Out is $19.95 for 60 vegetarian capsules. So if you were to take nine capsules per day the bottle, this will only last you a week! Even with three capsules a day, one bottle will not last you a full month. It also does not seem possible to buy in bulk. We think there are more cost effective alternatives on the market. This product offers a 30-day money-back guarantee. To get a refund, you need to return the unused portion of the product in the original packaging along with a receipt and a reason for the return. We found some quality reviews online for Gout Out, but they were quite hard to find. 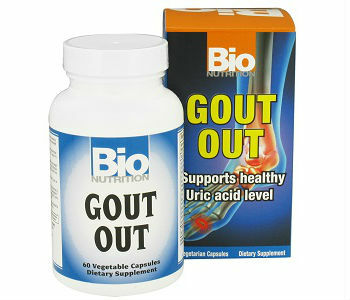 We like the fact that Gout Out is suitable for vegetarians and we have seen some good reviews online. The usage directions of 3 tablets per day is feasible but the high end recommendation of nine tablets per day seems excessive to us. Other gout supplements come in much more concentrated doses and do not have to be taken as often throughout the day. The customer reviews are good but we still always think it is worth looking further afield to see what can be found. Gout will become a very serious problem if left untreated and many companies are trying to capitalise on people’s needs with inferior products. Always carry out your own research and be sure to buy from reputable sources.